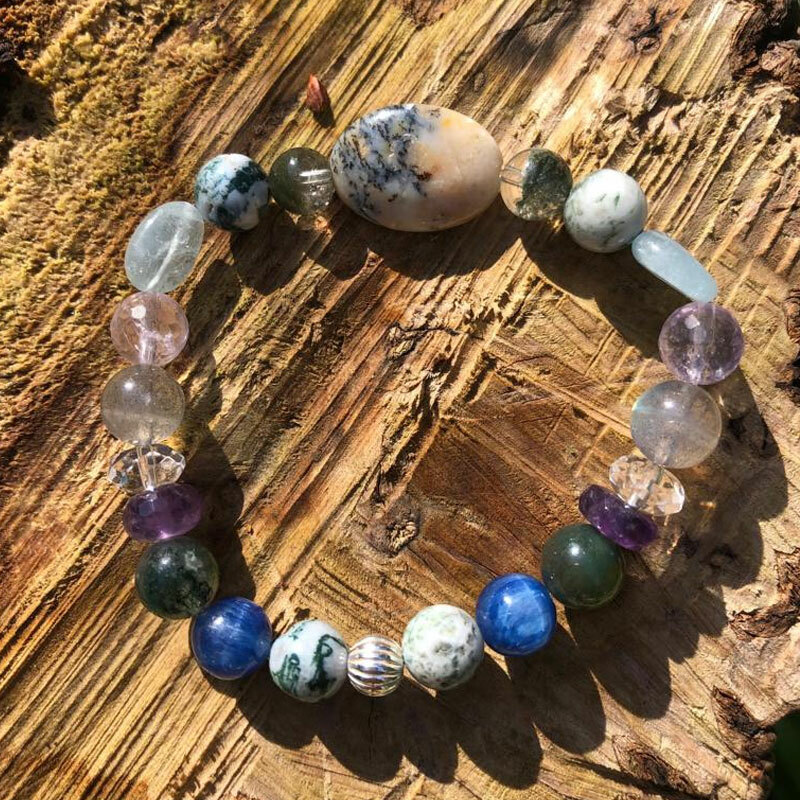 Shifts, upheaval, new seasons, new beginnings, limbo, frustrations, negativity and angst that doesn’t resonate with our true inner selves… this bracelet is inspired by the transition into a new energy and world birthing into being. Birthing something new is often uncomfortable, yet full of magic and new hope for adventure and joy. So much is coming up for us at this time, deep lessons and karmic patterns ready to be released – to ride the wave into this new space and allow the universe of supporting energy all around us to integrate easily. 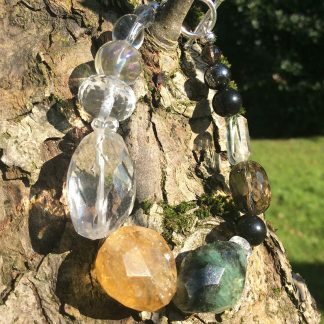 The Merlinite and Phantom Quartz combination of crystals felt significant and an extremely powerful combination at this time. This bracelet is connected to Hollow Earth – a space within Gaia that holds profound loving energy. It draws this grounding energy into your auric field; and allows you to move forward with security and a nurturing sense of love. 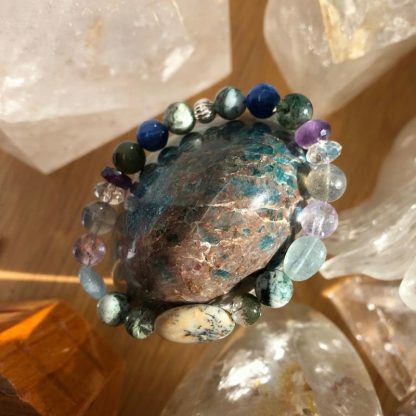 The protective and grounding Labradorite and Amethysts, together with the deep greens of Tree Agate and Moss Agate and Kyanite ocean blue; are a combination inspired by the intent to assist us ‘Ride the Wave’ into a new vibration of energy. To surf the rhythm of life, rather than feel the crashes of energy churn your sense of alignment. A magical stone that holds the knowledge of shamans, alchemists, magician-priests and other workers of magic. It can aid reading the Akashic Record, inducing travel into past or future lives. Merlinite can bring magic into your life. 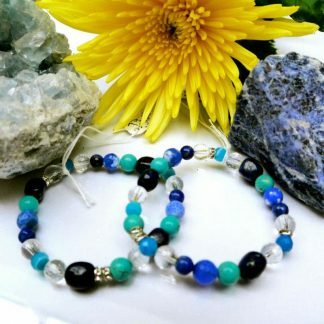 Symbolises universal awareness and its purpose is to stimulate healing for the planet. It activates healing abilities, facilitates accessing the Akashic Records, and opens clairaudience. A stone of inner peace which calms the nerves and emotions offering a lightness in your heart, mind and spirit. Offers the wearer strength in all endeavours and it helps to improve self-esteem and to see beauty in all you see. A stone of courage. Its calming energies reduce stress and quiet the mind. It has an affinity with sensitive people. It clears blocked communication and promotes self expression. It opens clairvoyance. The most powerful healing and energy amplifier on the planet. It absorbs, stores, releases and regulates energy and is excellent at unblocking it. It raises the energy to the highest possible level and contains the 7 levels of the rainbow and is the white light manifest on Earth. Stimulates psychic abilities and the intuition. 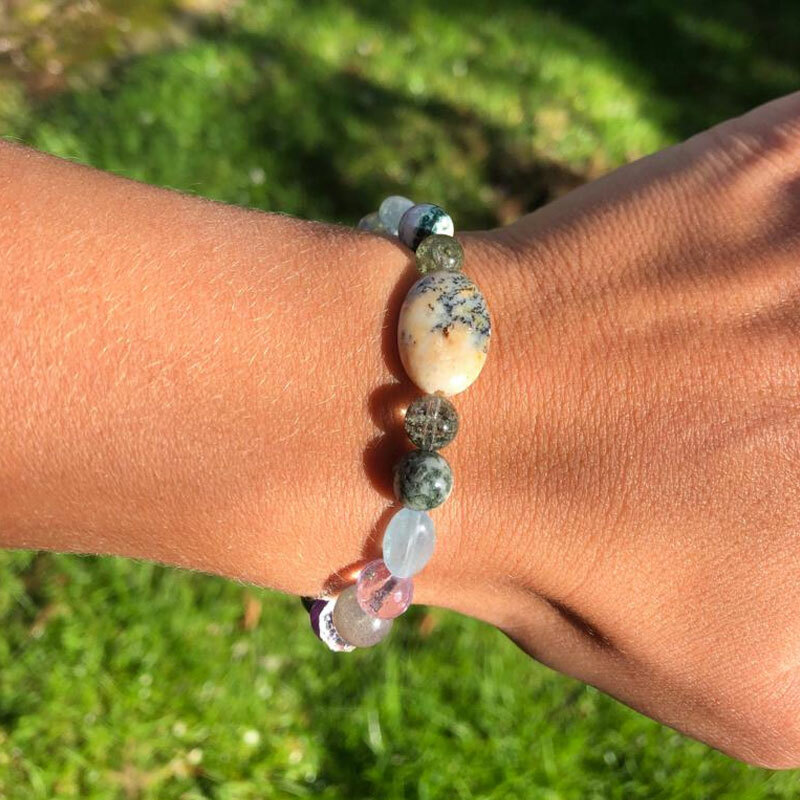 This crystal connects to spirit guides and instills compassion. A Kyanite does not hold negativity, it never requires cleansing. It encourages you to speak your truth, cutting through fears and blockages. 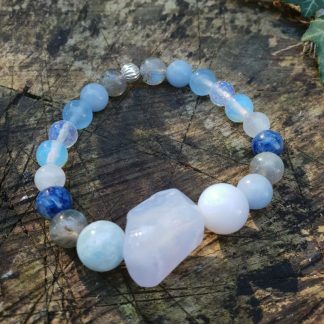 It opens the throat chakra and encourages self-expression and communication. It slices through confusion and dispels blockages, illusion anger frustration and stress. Kyanite is a natural pain reliever. It treats muscular disorders, fevers, thyroid and parathyroid, adrenal glands, throat and brain. It lowers blood pressure and heals infections. It releases excess weight. Iridescent Labradorite is a highly mystical and protective stone. A bringer of light. It raises consciousness and connects and universal energies. It deflects unwanted energies from the aura and prevents energy leakage. It banishes fears and insecurities and removes other peoples projections. It energises the imagination and strengthens faith in the self and trust in the universe.